Look at the Birdie is a collection of fourteen previously unpublished short stories from one of the most original writers in all of American fiction. In this series of perfectly rendered vignettes, written just as he was starting to find his comic voice, Kurt Vonnegut paints a warm, wise, and funny portrait of life in post—World War II America–a world where squabbling couples, high school geniuses, misfit office workers, and small-town lotharios struggle to adapt to changing technology, moral ambiguity, and unprecedented affluence. Here are tales both cautionary and hopeful, each brimming with Vonnegut's trademark humor and profound humanism. A family learns the downside of confiding their deepest secrets into a magical invention. A man finds himself in a Kafkaesque world of trouble after he runs afoul of the shady underworld boss who calls the shots in an upstate New York town. A quack psychiatrist turned "murder counselor" concocts a novel new outlet for his paranoid patients. 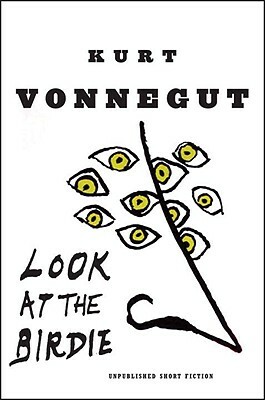 While these stories reflect the anxieties of the postwar era that Vonnegut was so adept at capturing– and provide insight into the development of his early style–collectively, they have a timeless quality that makes them just as relevant today as when they were written. It's impossible to imagine any of these pieces flowing from the pen of another writer; each in its own way is unmistakably, quintessentially Vonnegut. Featuring a Foreword by author and longtime Vonnegut confidant Sidney Offit and illustrated with Vonnegut' s characteristically insouciant line drawings, Look at the Birdie is an unexpected gift for readers who thought his unique voice had been stilled forever–and serves as a terrific introduction to his short fiction for anyone who has yet to experience his genius. Read "Hello, Red" and "The Petrified Ants," two of the stories from the collection, as single-story e-books before Look at the Birdie goes on sale. Available wherever e-books are sold. Kurt Vonnegut was a master of contemporary American literature. His black humor, satiric voice, and incomparable imagination first captured America's attention in The Sirens of Titan in 1959 and established him, in the words of "The New York Times," as "a true artist" with the publication of Cat's Cradle in 1963. He was, as Graham Greene declared, "one of the best living American writers." Mr. Vonnegut passed away in April 2007. Sidney Offit has written two novels, two memoirs, and ten books for young readers. He was a senior editor of" Intellectual Digest" and a book editor of" Politics Today," and for three decades he has served on the boards of the Authors Guild and PEN American Center. Currently, Mr. Offit is the curator emeritus of the George Polk Awards in Journalism. He lives in New York City with his wife, Avodah. Here are tales both cautionary and hopeful, each brimming with Vonnegut’s trademark humor and profound humanism. A family learns the downside of confiding their deepest secrets into a magical invention. A man finds himself in a Kafkaesque world of trouble after he runs afoul of the shady underworld boss who calls the shots in an upstate New York town. A quack psychiatrist turned “murder counselor” concocts a novel new outlet for his paranoid patients. While these stories reflect the anxieties of the postwar era that Vonnegut was so adept at capturing–and provide insight into the development of his early style–collectively, they have a timeless quality that makes them just as relevant today as when they were written. It’s impossible to imagine any of these pieces flowing from the pen of another writer; each in its own way is unmistakably, quintessentially Vonnegut. Featuring a Foreword by author and longtime Vonnegut confidant Sidney Offit and illustrated with Vonnegut’s characteristically insouciant line drawings, Look at the Birdie is an unexpected gift for readers who thought his unique voice had been stilled forever–and serves as a terrific introduction to his short fiction for anyone who has yet to experience his genius.